Stahl’s Ear is sometimes also called Spock Ear or Pixie Ear. The upper pole of the ear has a pointed appearance. In some cases there is a third crus to the antihelical cartilage but in many cases the superior crus is malpositioned. 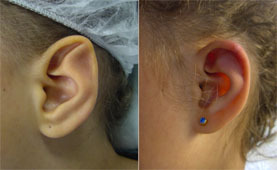 There are several variants to Stahl’s Ear, some seemingly being deformations of the ear and others true malformations. The ear is often larger than normal. It may affect one or both ears. The problem can be effectively corrected by excising the abnormal wedge of ear and using the cartilage as a graft to recreate the normal cartilage configuration. This can be done as a day procedure. A head bandage is required for several days.